We arrived Monday afternoon and headed to Costco and Safeway to pick up Mai Tai fixins (POM juice + dark rum) and some food to keep us going this week. It was raining. 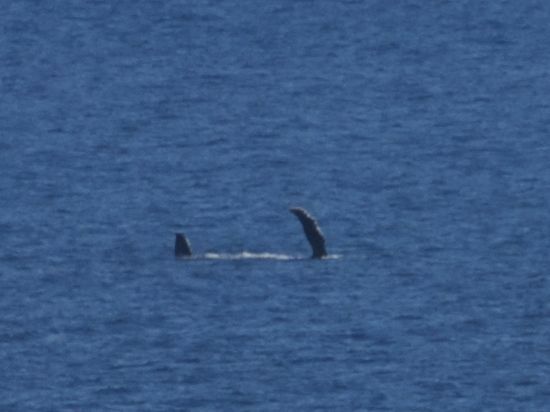 On the drive to Ka'anapali we saw some whale spouts and flipper slaps :) Very cool. We just chilled that night in the room. The next day, Tuesday, it was still raining and we headed down to the Maui Ocean Center. Very cool place! Highlights were the feeding the sharks and rays, when we got to see a ray's underbelly :) and an amazing iridescent display of jellyfish. Wednesday we got up at 5:30 in the pouring rain to get on a whale watching raft at 6:45, just as the sun came up. It rained off and on, but the highlight was seeing a "flying pickle" - a baby whale repeatedly trying to breach :) so cute! Afterwards, we headed up to a place recommended by a local as the best breakfast on the island - the Sea House. Wonderful!!! They had lots of dishes with local ingredients, affordable, right on the sand... Amazing. Afterward, we drove up to the north shore to see what was up with the waves. It was still raining, waves were probably 5' or so - big but not jigundous. We stopped at Hololua Bay and chatted with a local surfer/filmmaker under the palm frond palapa which protected us from the rain. But the surfers down below didn't have it so good. Half of them were in the "chocolate milk" aka "poo water". That's a technical term. But it was cool. We got back to the room, changed, and headed to Black Rock for some snorkeling. We were afraid we would be wading into the "poo water" but it was pretty darn clear. Saw tons of fish :) we had dinner in the room, spotted a few whales and hit the hay early. An exhausting but fantastic day. Thursday we went to Black Rock again and this time spotted our quarry - turtles! And tons of fish. Wandered around Whalers Village a bit and headed back to the room, then yummy lunch at Paiololo - juicy burger for Danielle, taro burger for me. Plus accompanying tropical adult beverages, of course. Really good. Next we hung on the beach to see the whales spouting and jumping. They do put on quite a show, though they are pretty far out there! Just after sunset we joined a Hawaiian navigator-in-training who talked about how Hawaiians, and Polynesians in general, navigate in their outrigger or double-hulled canoes. Very cool. And the stars were out so it was amazing to identify constellations and learn about how they rise and set and how to use them. The concept is a non-magnetic compass. That was a 'late' night, getting to bed about 9pm! We are party animals!! Friday was a relaxing day. We took a walk in the morning and browsed the local artisans tent shops that popped up overnight. Then Danielle prepared for and aced an interview while I did some therapy, journaling about the rough assignment this fall - Exploring Engagement. I think I have purged it for the most part :) Later we headed down to Ma'alaea Harbor to pick up race packets and T-shirts for Saturday's 5k. It took us 1.5 hours to go the 20 or so miles!! Because there were so many whales out, people were going like 5 mph. Tiring. After we got home we napped in anticipation of a night out. We went to Lahaina and had some great pizza at Lahaina Pizza Co and grabbed some gelato (lavender for me, chocolate sea salt for Danielle) and wandered the shops. Truly a late night - didn't get to bed til 10!